The central nervous system is made up of the brain and spinal cord. The brain functions to receive nerve impulses from the spinal cord and cranial nerves. 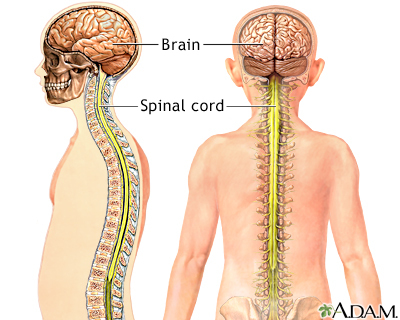 The spinal cord contains the nerves that carry messages between the brain and the body. Spinal cord injury can occur when there is damage to the cells within the spinal cord or when the tracts of nerves that run up and down the spinal cord are severed.